NO two days in the Scottish hills are ever the same so I suppose the most surprising aspect of my latest outing was that I found myself surprised. I had watched high pressure moving in from the west with excitement, the promise of more settled conditions and clearer skies opening up a range of possibilities. I had meticulously studied the forecasts for the best place to be when it arrived, eventually choosing the area encompassing the long glens to the west of Inverness. My base was near Beauly and the choices seemed endless: Beyond the locked gate into Glen Strathfarrar, the high, winding road to the Mullardoch dam or the beautiful run through the forests of Glen Affric. The snow coverage was impressive, far more substantial than that seen on my journey from the east. 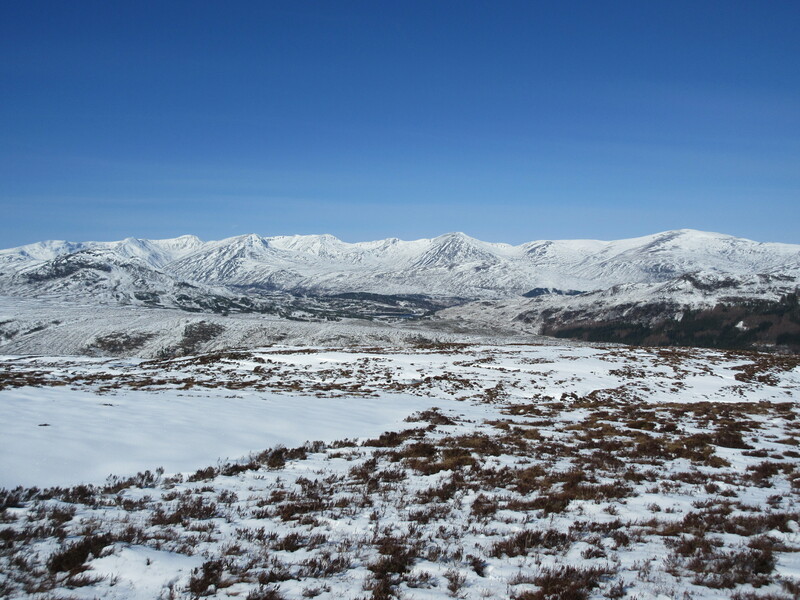 I had noticed reports of those on Munro expeditions over the last few days falling short of their targets due to the depth of snow, so decided to aim for the lesser heights. The long run down Strathconon was into dark skies. It felt if the early sunshine had been refused permission to enter further, and the landscape was squeezing in. A few young stags were taking advantage of the cattle feed near Inverchoran Farm, slipping in and out of the nearby tree cover to grab a bite. 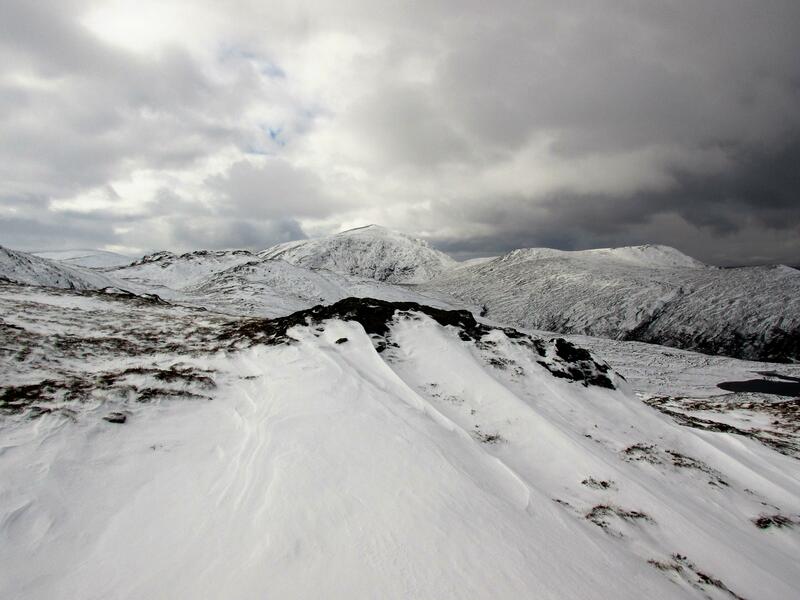 I ignored the track up Gleann Chorainn and headed south on a track gaining height – and the snowline – quickly. Another surprise, footprints. Beinn Mheadhoin is a lovely little hill with splendid views but I hadn’t expected to see another soul on a midweek day of winter aspirations. Ten minutes later, I met an elderly couple coming down. Their tracks led all the way to the summit, making the ascent line a lot simpler. I dropped down fast as light snow showers made half-hearted incursions, and the horizons vanished and re-appeared in varying shades of grey and black every few minutes. A short sustenance break at the car and I was ready to start my second hill. Meall na Fachaoig lies to the north of the road, and although higher than Beinn Mheadhoin is supposed to be a shorter climb. That doesn’t take into account snow cover. Even then, I managed up and down in two and a half hours, five minutes shorter than the first hill. No problem then doing another two the following day with an earlier start and wall to wall blue skies. Carn a’ Chaochain was the first objective, book times similar to yesterday’s pair. 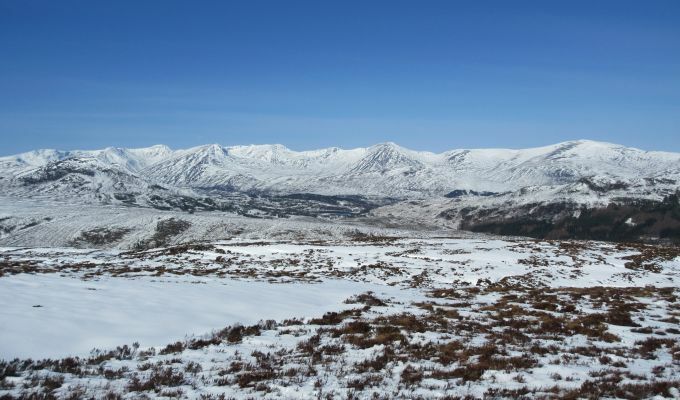 That would leave plenty time to head round to Glen Affric and take in Beinn a’ Mheadhoin and its magnificent views down the length of the glen. Unfortunately, Carn a’ Chaochain proved a much bigger handful. First there was the drive to the road end at the pony trekking centre at Cougie, past Tomich and Plodda Falls, the surface deteriorating with every mile until it is basically reduced to a forest track with speeds of more than 15mph ill-advised. There’s no chance of going astray. Just like a Trump administration policy, all you have to do is keep following the piles of horse manure to reach the source. The suggested approach is to branch off at a small cairn and follow a track on to the hillside. Problem – there is no cairn, and the track was invisible, buried under a blanket of snow down to ground level. Surprise, surprise, the ascent was tortuous. Heather and fallen trees, hidden holes and undulating ground which meant sinking knee-deep into the white stuff with every other step, no chance of gaining any rhythm. When I reached the first ridgeline and saw how far there was still to climb, I knew that any plans for a second hill were out the window. It took about an hour longer than I had planned to reach the summit, but the compensation was the 360 degree view; big, snow-plastered ridges stretching out under a solid blue sky. The descent wasn’t much easier, huge banks of snow to be ploughed through, but I had come to terms with my lot and was just enjoying the moment. It had taken me almost double the suggested time for a 2300-ft hill. It’s worth bearing in mind if you are tackling some of the bigger guys this weekend.